I rarely watch cable news, but that plan sounds plausible enough. Indeed, it actually sounds a lot like NPR, although NPR’s eccentricities are fairly muted, at least relative to Glenn Beck’s (Douthat’s exemplar of eccentricity and unpredictability). Of course, we should distinguish between NPR’s news programming and their entertainment programming. Perhaps the news programming is too stultifying to meet Douthat’s standard. I would describe it as “lengthy” and “respectful.” Certain stories can be “riveting.” But your mileage may vary. Something in their business model is working. And I have a hard time imagining that NPR listeners won’t watch televised news programming as a matter of principle. So where is the NPR of cable news? Still: when people wonder why lefties won’t listen to talk radio, they’re wondering the wrong thing. Lefties do listen to the radio, they just prefer listening to a different kind of radio than conservatives. But why? I’m thinking about a piece for the magazine right now that hasn’t really taken form yet, but as I noodle about it this is one of the questions that I keep coming back to: when it comes to radio listening, why do conservatives prefer the style of Rush/Sean/Laura/etc. while liberals tend to prefer the style of NPR? Is it just a historical accident or is there something more to it? I have a few thoughts on this. One is just to note that in a market with relatively few firms and relatively high barriers to entry, you should probably just expect conservative decision-making and bad business practices. If there were 1,000 different companies running cable channels and starting a news station were easy, everyone would try everything and we’d see what works. But cable isn’t like that. After all, it seemed obvious to me and to many liberals for years that the lesson MSNBC should learn from Fox News is that it would make more money by offering a liberal counterpoint network. But MSNBC executives initially drew the opposite lesson and tried to run a second conservative network. Recently, they’ve shifted in the more sensible direction, but only quite slowly and still with more airtime given to former GOP Congressman Joe Scarborough than to Rachel Maddow and Keith Olberman combined. The other is that CNN actually does produce a more NPR-esque network in the form of CNN International. I have no idea how many people would watch this if it were widely available in the United States, but a definitely prefer it’s calmer, more relaxed tone to the extremely busy and panic-inducing style of US cable networks. I’m not deeply familiar with the economics of cable providers, but it seems to me that with hundreds of channels now available, it shouldn’t be so hard for CNN to get content that it’s already producing anyway out to a larger number of people. Last, in response to Kevin Drum I’m not really sure what’s so liberal about NPR except by wingnut rules whereby anything that isn’t an organ of the conservative movement is per se liberal. Morning Edition seems like very normal “Democrats say x, but Republicans say y” news coverage, and Marketplace is kind of Economist-style highbrow center-right. Other shows may tilt the other way, but I take it that NPR has a large audience precisely because it doesn’t narrowcast to an ideological niche market. I’m not a big fan of NPR news. I find it weasely and annoying, though I do like the stuff from the BBC they run. But it is what lefties listen to. I wonder if it would be better if NPR broke free of the government and supported itself entirely through private donation. If they fired Juan Williams, Ken Rudin, and Mara Liasson, I’d be happy to start giving them money again. To me, the reason seems dead obvious. Radio is the only delivery mechanism that you can absorb while doing something else. Driving? Check. Cooking? Check. Reading email? Check. Lingering in bed after the alarm goes off? Check. I don’t have a “principle” against watching televised news. I just don’t have time. You could have Ira Glass and Carl Kassell doing the Hustle surrounded by frolicking puppies and I still wouldn’t make the time to sit down and watch. I’ve been thinking a bit about this NPR graph that’s been floating around. I wish it included another data point: The Economist magazine. 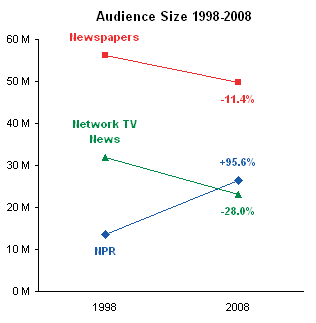 Their explosive growth over the last decade is well known, but consider that the publication had a record year in 2009. Would that we all enjoyed circulation booms amidst crippling global recessions. So what do NPR and The Economist have in common? Two things jump to mind. The first is that they both situate themselves firmly between news and opinion, in that netherworld I think of as analysis. This is a hobbyhorse for me, but my grand theory of the media right now is that the rise of online media made newsgathering an extremely crowded and quick marketplace. That’s left a lot of publications that either aren’t used to the competition (think newspapers) or aren’t suited to the pace (think newsweeklies) a bit confused about their identity. Some of them have responded by embracing opinion. That’s also a bad move. The opinion marketplace is, if anything, more crowded than the news marketplace, and it’s hard to really break through in it unless you’re willing to travel pretty far along the partisan continuum. But because news stories move so much faster and opinion is so much louder, there’s actually more demand for media that explains what those fast-moving stories are actually about. This is a need that is going largely unmet. Both the Economist and NPR are imperfect products, but that’s fundamentally what they’re doing. It’s not quite newsgathering, and it’s not straight opinion, though there’s occasionally opinion in there. It’s analysis. It’s how to understand the stuff that other people are reporting and opining.